Packaging: Can't go wrong here...a package full of stars! Base Sticker Design: Slick, open design with action photos and an emphasis on the players. Due to a blurry picture, it doesn't show the Giants kicking a FG against the Pack..but memorable Super Bowl moments are found as well! Inserts: Shiny, updated players, rookies..it has everything a kid, or a grown-up kid will love! Overall: $1 a pack. Comes with rookies that some people collect as rookie cards..must say we do...and you can find albums to put the stickers in for $2. Its a fun chase to see if you can get them all and it doesn't cost much to do so. The design of both the stickers and album are catchy. This has always been a great idea for Panini as a draw to our younger generation of collectors! Extra Thoughts:I like the sticker albums as a starting point Kids can bend, tear these but it takes a lot to destroy them. It will teach them to take care of their cards when they are ready. Also, by having numbers on the back and having them match the numbers on the back to the numbers in the book teaches them how to organize. Fed Ex arrived with a surprise...Rookie and Stars football 2012!! From the outside to the inside this product was a great bust. Early on the hits were disappointing but the last pack in the box brought us excitement! First off, I would like to say thanks to the WONDERFUL people at Panini America for providing us with this box to review. Here are many places you can find Panini America: official site, blog, Twitter, and Facebook. And as always...we will do some giveaways from this product! Box Design: Love the design!! Best one so far this year. A ton of great players, the box top pulls up and Peyton Manning and Trent Richardson are die cut. This is the kinda of box I use for decoration and card storage. Just check out what I mean and search Tips on Collecting on a Budget on our blog. Pack Design: Love shiny wrappers loaded with stars. Great design and color scheme. Base Card: Update teams for players, a clean design with action photos. Silver foil outlines player names. I like what I see from this product. Rookie Cards: Players in team uni's, and still the nice base design as we spoke about above. Inserts: As you can see there is a great lineup of them. The True Blue feature blue color instead of the silver on the players names and say True Blue. Longevity is silver cardboard. Gotta love diecuts and especially well done ones. And the Greatest Hits, a set dedicated to the defensive stars of the NFL love how Panini does the black and white then top it off with color. They have done that with a lot of their inserts and its working! There is a gold version thats numbered of the greatest hits. Memorabilia: The design is spectacular and really enjoyed the larger swatch used for the Crusade Rookie jersey and Revolution Materials has a great layout. Autographs: You are guaranteed two autos per box...the first pull of our box was of Devon Still which is just the great base design with the added auto. However, our big pull from the last pack in the box of Russell Wilson Crusade auto is outstanding. Its a thick card, Its got an eye catching design..and is one of the best looking auto cards I have seen in awhile. Overall: Great base design. Nice looking memorabilia and the Crusades autos are a big chase and are numbered to 199. Nice amount of base rookies, inserts and with the 4 hits this is a can't miss product. We have seen some big hits from this product including the one we got. Though lacking a little in design, the autograph does stand out well against the color scheme of these cards. Zobrist is also a pretty decent player as well. We were pretty excited to see this box at our doorstep. The first 2012-2013 basketball product out on the market. There is a lot of excitement surrounding this product knowing it has both the 2011-2012 rookies and the 2012-2013 rookie class. This box did not disappoint us. Box Design: Thunder star Kevin Durant. The Box is big because its loaded with packs. And on the front it lets you know how many, how many cards per pack and how many hits (however that would have been better to have enlarged that as well like the number of cards and packs). The design is lacking a little..but not bad. Pack Design: The pack design on the other hand is much better than the box. Shiny, big ole Kevin Durant. Number of cards per pack. Its all there. Bonus Pack: Kobe Anthology. Look for one of these per box for all of Panini's 2012-2013 basketball card releases. The base design which is to the left is great and captures all of Kobe's greatest moments. You can also find rare autograph and jersey versions. Base Cards: I like the design. It brought me back to the early 90's of hoops except these are much more colorful and bold. The inclusion of coaches cards is nice as well. The only problem I see is they chip very easily because of all of the color. Rookie Cards: With so many rookies to find in Hoops with two years worth, you really have to know your players. The 2012-2013 rookies are shown with suits and team balls while last years blend in with the other base cards so you have to look at the backs of the cards to see that they only have stats for a year...unless you know the entire class from last year. This is assuming Beckett calls last years rookie class in here rookie cards. Inserts: A nice variety. Some rookie ones, glossy, great camera shots ones. The only issue we had with it was the Artists proof like the Chris Paul. Its not numbered and it blends in with the color of the cards. Autographs: You get two per box and we were luck enough to get two good ones in Jimmer Fredette and MarSHON Brooks. Some boxes come with even three autos. Overall: Nice design.A lower end product with two autos per box. A good amount of inserts and we got NO doubles. And with a double packed rookie year for the price you pay and the value you get...its hard not to pick up a box..or two of Hoops. To celebrate Madden 13's release...we went and found this card to share! 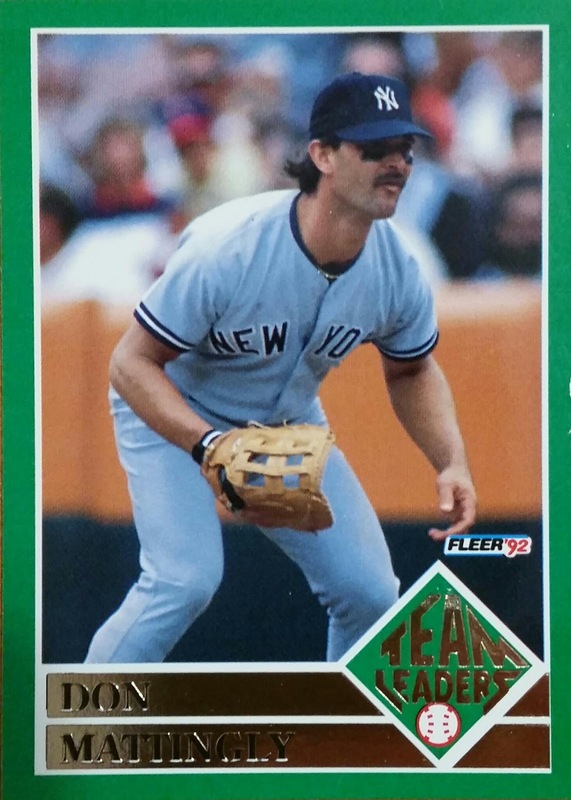 How many of you own this card or are chasing down the game today? We were pretty excited to see this box at our doorstep. The first 2012-2013 hockey product out on the market. Score for any product is the best bang for your buck! Box Design: Typical Score box design. Lets you know how many packs and cards per pack right on the front. Pack Design: I like the pack design...like the Hoops we did the review of...the player jumps off the pack and grabs your attention. Base Card: Even though there is a wide border, the action photos used in Score take away from how much border there is. The team emblem stands out as well. I like the base set it starts with a subset and ends with a subset. Reminds me of how cards used to be. The players are also put by team and teams are put by alphabetical order making searching for a player on a certain team much easier. Rookie Cards: I like the hot rookies. They stand out in the set and you know its a rookie set. 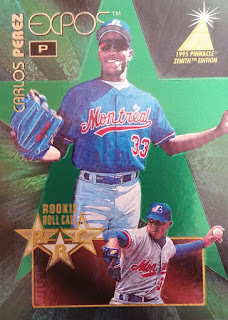 Inserts: No glossy this year but they have a gold parallel instead per pack. Above is an example, its just two gold strips down the side of the Taylor Hall card. The other inserts are nice. Team Score brings back an old design to the new Score. Net Cam has some great angles and photography. The inserts look nice overall. Autographs: For the second straight time, we pulled an auto from a box of Score. Check out our Score Football 2012 review for the first one. Justin Abdelkader of the Red Wings was our hit. Nice auto and design on these. Overall: A good amount of rookies, usually one per pack on average, inserts, chance for autographs NO doubles, and there is no complaint from this blogger on Score Hockey. You get a lot of cards and value for a little bit of money. We really like the look of these autographs. 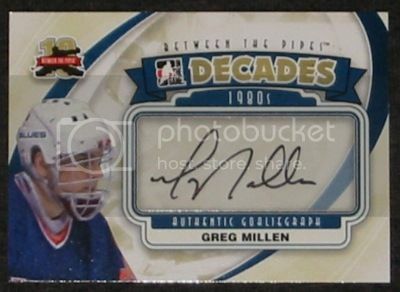 Greg Millen also has as nice looking one. It's been awhile since we posted a hockey card for a Random Card. Landed 3 inserts in this pack..bet that doesn't happen to often! Overall, some good inserts. A great break with the Topps Season Opener landing a ton of rookies including the best ones...did very well with value with these 2 breaks. I think this guy has a lot of upside...lets see if he can get the playing time to prove himself. Along with the great singles I bought..I found some 50 cent packs. Here is a break of 36 packs of Topps Basketball 99-00 and one pack of Collectors Choice 97-98 Basketball. Overall, for 50 cents a pack..not really going to argue. Got some good rookies. A few good inserts. Most likely got my money back.